I did not drink the moonshine. It laid waiting in the tall grass, perched like a Halloween ghoul, replete with sharp teeth and halitosis. I had nearly tripped over the spectral glass vessel on my jaunty rounds between bonfire and beer stack (no need for a cooler at 30 degrees Fahrenheit). As the night wore on and my steps grew increasingly jagged, the bootleg hooch beckoned with increasing seduction. Indifferent to the booze’s wanton provocation, I went into the house to see if my girl was still there. Not finding her, I was greeted by a festive tray piled with “pity poppers”. The basis for the appetizer’s charmingly self-deprecating sobriquet was far more apparent last night during my euphoric inebriation. 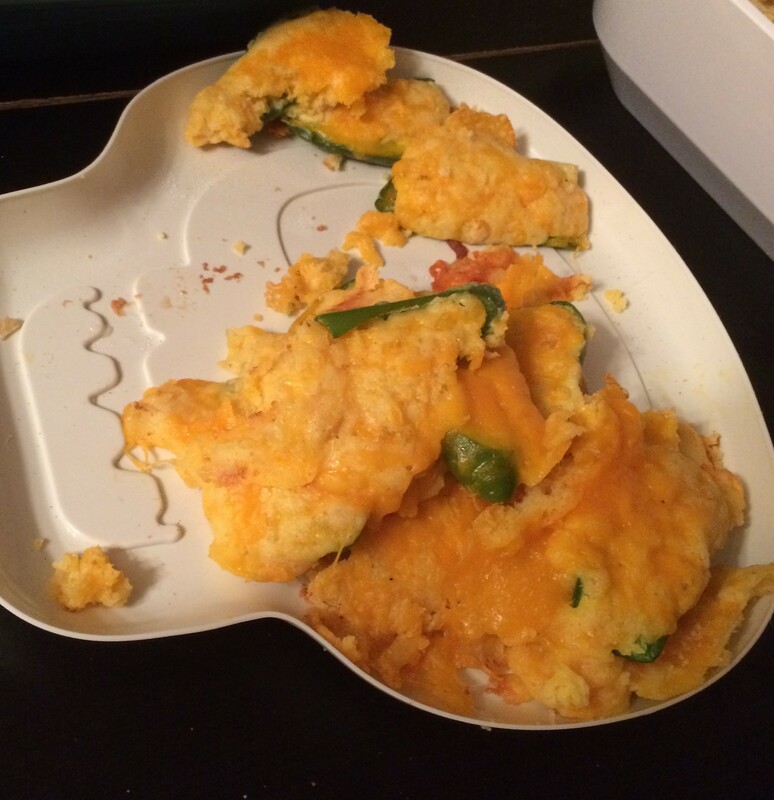 Nonetheless, my winsome neighbor’s stuffed jalapenos were a smashing success. The experience set me to planning to stuff something…..with chili. Dice the stems and sauté them in butter along with peppers, garlic, onion, and spices- about 5 minutes. Add pretzels and cheese, sauté for 3 minutes. Place inverted mushrooms caps onto a baking sheet. Scoop the sautéed mixture into mushroom caps and bake for 10 minutes at 425. It doesn’t happen often, but the Involuntary Taste Panel offered up some sincere compliments. 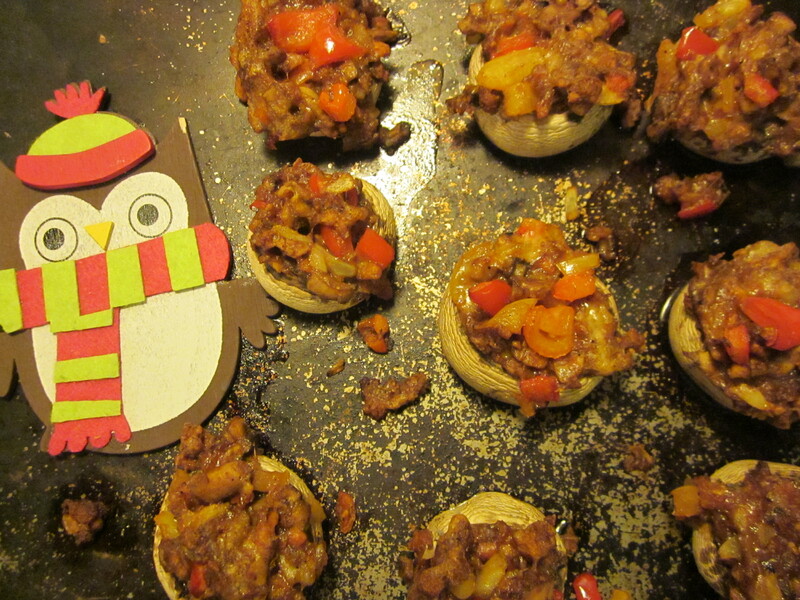 Mrs. Chili365, The Pirate, and Chili Jr absolutely loved the chili stuffed mushrooms. I found them to be quite tasty- a zesty appetizer with a wealth of cheese, pepper, and chili flavor. The notes of onion and garlic were welcomed and earthy. Chili is almost exclusively considered a main course. It is refreshing to see it make a splash as finger food. Thank you Frugal Hausfrau for providing the revelation. This entry was posted in appetizer, mushroom and tagged beer, chili, finger food, humor, moonshine, party, party food, pepper, recipe, spicy, vegetarian, writing. Bookmark the permalink. 🙂 So different than anything I would have guessed – and your story, so funny! The pretzels have to be the kicker here! I must say I’m glad your Involuntary Tasting Panel enjoyed these…I had a momentary fear of being a party, in any small way, to the invention of a Chili stuffed mushroom – visions, perhaps, of being hunted down for for such a thing being inflicted upon the IVP. Especially that Pre. Of course, tell him I’m only kidding. You went way beyond all expectation – I can see more inventiveness in my own future! Your wild abandon has made me feel a bit stodgy! Thank you immensely for providing the template for the awesome appetizer. The pretzels were a desperate move by a desperate man. In the end, it all worked out. Don’t worry about a thing, any blame for the chili experiment squarely falls on my shoulders. No one else can take the rap (or wrath) but me. It is always a joy to see what you’ve come up with. I am looking forward to seeing what is next. 🙂 I feel the same way about your blog – I’ve already shared it with several friends and family members!